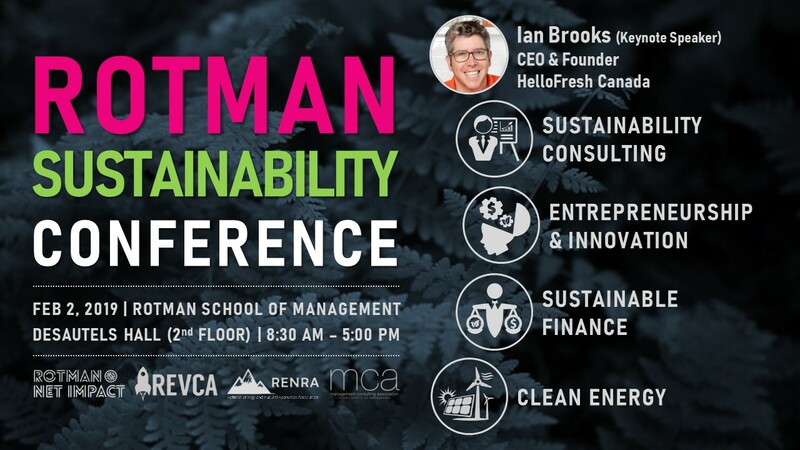 On February 2nd, 2019, Rotman Net Impact in conjunction with other industry associations at the Rotman School of Management will be hosting the inaugural Rotman Sustainability Conference. The full-day event will feature themed panel discussions and networking sessions related to Sustainability Consulting, Entrepreneurship & Innovation, Sustainable Finance, and Clean Energy. The goal of this conference is to provide students and professionals in the Greater Toronto Area with the opportunity to engage in meaningful discussion and exploration around impact-focused careers. If you are a Rotman student, registration is live in Rworld. For students and professionals in the GTA, you can register here. Early coffee & cookies, food, and drinks will be provided. Please do not hesitate to reach out to Danielle.Ocampo19@Rotman.Utoronto.Ca or Kiel.Guerrero19@Rotman.Utoronto.Ca with any questions. We look forward to seeing you at the Rotman Sustainability Conference!